From FASA grants for individualized projects, to student run exhibitions at the VAV Gallery and the Art Matters festival, Concordia fine arts students are given many opportunities to showcase their work annually. Student work of all mediums, and touching upon a broad range of issues is included; nothing is left unaccounted for. Among these are the works of Elisabeth Perrault, Petro Psillos and Camille Charbonneau, student artists who work in a variety of mediums but share some common political and material ground. These three student artists have used shirts as the medium for their messages. The transparency of the material is for emphasis of the voluntary blindness of our society in the face of this ethical problem,” the artist said. Perrault’s design, choice of fabric, buttons and screen printed image encourage consumers to divest from fast fashion, reflecting the past and present of the clothing industry. Similarly, painting and drawing student, Petro Psillos, created another large t-shirt made out of smaller, identical ones. “War (1991) is part of an ongoing series of authority-related t-shirt installations and sculptures,” said Psillos, who sewed four promotional t-shirts worn by Cineplex employees (himself included), to depict Ricardo Trogi’s recent film, 1991. Both Perrault and Psillos’s pieces critique contemporary consumption and labour exploitation by using the shirt as a medium. “Since we look all the same wearing the same t-shirts, we are easy to group as one entity. To the outside customers […] we look all the same, without personality, not individual, not unique.” said Psillos. 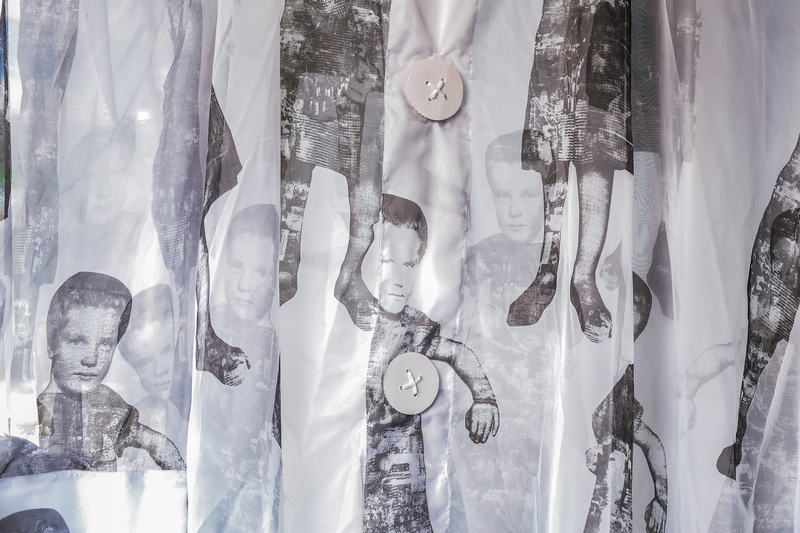 His work—exhibited as part of Art Matters during Sites of Embodied Silence at the VAV Gallery—uses the relatability of the shirt to confront viewers, increasing the typical size of the garment to create a wall, a physical obstacle to navigate in the gallery space. War 1991, Petro Psillos in Sites of Embodied Silence at the VAV Gallery during the Art Matters festival. Photo courtesy of Art Matters. For War (1991), Psillos intended to connect the exchange between business and culture as a testament to Quebec’s shrinking national identity. He saw this as a parallel to the way Cineplex and other corporations impose authority over their employees, especially through language control within immigrant communities enforced by Bill 101 and 115. In both cases, I am stripped of my individuality and expected to submit to another person’s perspective,” said the artist. Through the film it represents, to its colour and wear, War (1991) contains powerful references to escapism, globalization and bloodshed. Buttery popcorn stains allude to the dispute of oil and its production, and the size and name of the piece refer to the then recent demolition of the Berlin wall. As a global symbol, the shirt can also be intensely personalized. Camille Charbonneau’s performance piece, 1 Corinthians 6:19, conceives the body as something that is borrowed, to be confined to a gender binary, and something to be hidden. Physical care, clothing restrictions and overall behavior enforced by social norms compiled with critiques on globalization, consumption, violence and politics are embedded in these artists’ respective works. As an often mundane object, the shirt embodies all of this, and proves to be a symbol of Concordia’s 2018-19 art scene.